If you have an external hard drive or USB flash drive that you’d like to use on both Macs and Windows PCs, choosing the right file system to format the drive can be confusing. Learn a few ways to make your drive Mac and PC friendly. Mac OS X’s native file system is HFS+ (also known as Mac OS Extended), and it’s the only one that works with Time Machine. But while HFS+ is the best way to format drives for use on Macs, Windows does not support it. If you’re only going to be using your external or USB flash drive with certain PCs – such as at home or the office – you might be interested in a program called MacDrive. When you install MacDrive on a Windows PC, it will be able to seamlessly read & write to HFS+ drives. This isn’t a good solution if you need your drive to work on any PC without installing software, though. The most universally supported way to format your drive is with the FAT32 file system. It works with all versions of Mac OS X and Windows. Case closed, right? Well, not so fast. Unfortunately, FAT32 is a very old file system and has some technical limitations. For example, you cannot save files that are larger than 4GB on a FAT32-formatted drive. This is a deal-breaker if you work with huge files. The other limitation is the total size of the partition. If you format your FAT32 drive in Windows, the drive partition cannot be larger than 32GB. If you format it from a Mac running 10.7 Lion, the drive partition can be up to 2TB. Much better, except for that pesky 4GB limit. The exFAT file system eliminates the two major deficiencies of FAT32: the largest partition and file sizes it supports are virtually unlimited by today’s standards. Awesome, it’s perfect! Almost… since exFAT is fairly new, it isn’t compatible with older Macs and PCs. Any Mac running 10.6.5 (Snow Leopard) or 10.7 (Lion) supports exFAT, while PCs running Windows XP SP3, Windows Vista SP1, and Windows 7 are compatible. If you know you’ll be using computers running updated versions of these operating systems, exFAT is the clear best choice. Select your external hard drive or USB flash drive from the list on the left. Click on the Erase tab. Select the format – Mac OS Extended (HFS+), MS-DOS (FAT32), or exFAT – then name the drive. Click the Erase button and the drive will start formatting. Be aware that formatting a drive deletes all of the files on it, so back up anything important before completing this step. Go to Computer (or My Computer in Windows XP). Select your drive from the list and right-click on it. Choose Format from the contextual menu. A window will pop up where you can choose the format – NTFS, FAT32, or exFAT. Make sure the allocation unit size is set to default and type in a volume label. Could you tell me what I could do if I already have files on my hard drive but I want to use a portion to back up my Mac? 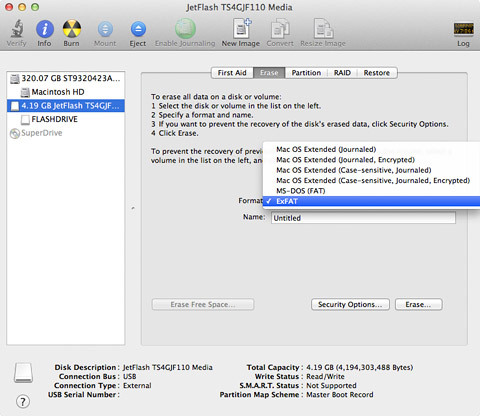 There is a program that works with mac OSX Lion and reads and writes to NTFS formatted drive. Paragon NTFS is about £15 and reads and writes to NTFS drives – you won’t ever need to worry about what format your drives again. Multi operating system bliss !! i always use FAT file system with Pen Disks to make it support on my Mac and Windows platform. NTFS never worked in my case.. I did exactly what you said to do in order to format a LaCie 160gb external hard drive to exFat for use on a Mac (OSX 10.7 Lion) and a PC (Windows 7). Unfortunately, now my Mac doesn’t “see” the hard drive anymore and my PC tells me the device is not working properly (error Code 43 in Device Manager). Before reformatting from a NTFS, the LaCie worked fine on my Mac and my PC “saw” it but I couldn’t access it. It is connected via USB 2.0 and AC/DC power. Where could I go or what resource(s) is/are available for me to solve this problem? I heard using a firewire might help. Nice article. It helped me reformat a 32GB SanDisk Cruzer to use exFAT so I could store large files on it. Thanks! I have a 275gb Kingston usb thumb drive formatted in exFAT. It will handle .dmg files but if I add a “folder” containing .dmg and other items the folder is blank when I try to access the data inside the folder. I just got a Seagate GoFlex Desk External Drive, and after reading your article, I tried to format it for ExFat but got an error: Invalid Option. Seagate tells me that they do not support ExFat. They say “Reformatting a drive in ExFAT is something that we don’t support. It can be an unstable format that can cause data corruption without warning.” Have you found that other hard drive manufactures say they don’t support this format for the same reason? Should I turn the hard drive back in, and get a different one, where the manufacturer supports this format. Is what Seagate says true? Thanks. I just got two Western Digital 3TB external hard-drives. I want to be able to use them on both Mac & PC. When i go to format it on my Mac, FAT32 is not an option, and every time i try exFAT i also get an “error: Invalid Option”. I then tried to do this on two other Macs & it still wouldn’t work, but then I tried it on a work-mate’s Mac today & it formatted in exFAT fine… How unstable is exFAT? I don’t want to lose the media i store on this drive. I don’t mind formatting it in FAT32, but it’s not an option when trying to format this hard-drive. Any suggestions? Is there a free formatting application that is good to use instead of using the “Disk Utility” on Mac..? Thanks!! Awesome!! Succesfully converted my hard drive to exFAT. Thanks a lot. I’ve read that this exFAT is possibly not the greatest for archiveing due to it only having one table rather than one at each end of the drive, is this true? I’m looking to archive Video files averaging 15-20 gigs. written from mac but possibly played on PC in the future. any thoughts? we do have two drives that will be stored in different places. I want to remove MAC OS from my dell laptop, no any windows OS installed on it, how to remove MAC and install windows 7 again, i tried all with disk utility but didn’t succeeded on it. NTFS also doesn’t work for that. I tried to share files between my Mac Book Air and my laptop win 7. Many thanks for this help – it worked wonderfully! Unfortunately ExFat didn’t work for me. when I try to copy videofiles over on my external harddisk: La Cie Rugged (large mov.files for ex. 6 Gb), I get the message: Can’t be stored there is not enough space. Exfat is not reliable and stable. You will have issues down the road. exFAT is designed especially for flash drives! Don’t use it for HDDs. Please read the manuals before posting wrong instructions! l just bought a new 64gb SONY flash drive and i am unable to use it. l tried to format it but it will not format.lt does not even indicate any file sytem when you give the format command. What should i do in order to make use of it? I have just bought a Lacie 1TB and formatted it 100% for mac – and then realised i need someone to view footage that i’m about to transfer it to. is this still possible? can i re-format it? Good to see some options here rather than just FAT32. Be warned that exFAT can be slow. I’ve had drivers for Mac on Windows Systems and NTFS drivers for Windows on my Mac and all work well. You can get the software to try before you buy too. If its a one off like copying from a friends Windows to your Mac or vice versa then the trial may be the cheapest and easiest way to go. Hi! I have an IMAC running OSX 10.7.5 I recently bought a Trekstor DataStation pocket light 500 GB external portable hard drive 2.5″ I need it to transfer 190 GB of video and audio files to give to an editor. I received it and a small paper inside said it’s not compatible with my IMAC. Only to READ files. I’m not sure what system the editor will use and after reading all the comments above, I’m really hesitant to re-format the disc before moving the files onto. Now the files are on another TrekStor external drive that the camera guy lent me. I am not very technical and don’t want to screw anything up. Can anyone help? This is amazing article! Finally answers all my questions about formating the external HDD’s.. thank you very much!! I do hope you can help me with this … I was using my sisters Mac temporarily and before giving it back to her I copied all my files onto a thumb drive. Tonight I copied those files to the hard drive of my PC laptop and removed them from the thumb drive. For whatever reason I am trying to open a few of the files in a certain program, but it keeps telling me that the file I am trying to access is not supported. Someone mentioned that maybe it has something to do with the thumb drive. I have no idea what to do and I am praying that I didn’t lose any of my files. Thanks so much!! Awesome advice :) thank you! I’ve read too many posts from people having all sorts of problems using exFAT to consider using it. Maybe one day, but for now, “not ready for prime time!”. 2. make the NTSF drive both readable and writable in Mac OS X. There are different ways to do that. CTRL+X to exit the terminal. 3. Unmount your drive, then plug it back in. it won’t show up anymore. it’s OK.
There’s your NTSF drive! Now you can do whatever you want with it in Mac OS X.
I’ve not tried it myself, but I’ve only heard good things about it. You can download it here: http://www.partition-tool.com/download.htm. Make sure to download the “free for home user” version. The other methods involve using 3rd party drivers such as: Paragon NTFS or Tuxera NTFS. They’re not free, but they won’t break the bank. Thank you for the clear and comprehensible explanation! Thank you for explaining the various type of formats! Thanks your instructions, i’m choosing use NTFS now rather than exFAT for my new HDD. Hy,i format my hard drive on “Mac OS Extended (Journaled)” ,but i want to format back to be used on Pc,but when i go to ERASE,appears me only MAC option…What should i do ? This is a very useful article. exFAT is excellent for the transfer of large video files. One limitation is that it is not useful for Mac backups or for use as a Mac Boot Drive. Just was looking how to format usb.I got the solution from here thanks for sharing nice article. Excellent way to explain how to format usb? You have done great job with steps and images. NTFS is fine. Install some 3rd driver on Mac to support fully NTFS is my recommendation. Thanks, pretty much well explained in a way. yesh NTFS is now my recommendation. I want to transfer all the the files from my Windows formatted external hard to an exFat formatted external hard drive. Which laptop can I use safely to do this, a Windows laptop or the MacBook Pro ?